Story: Bummi is a teddy bear who plays with his friends. Background notes: Bummi is one of the few children's magazines from the old DDR (East Germany), and one of the even fewer series from DDR to survive the German reunification in 1990. The series started in 1957 from the publisher Verlag Junge Welt Berlin, and did not change publisher until 1991, when the series was taken over by Pabel-Moewig Verlag KG. It has not been possible to obtain information on the creator(s) of the character. There are no available record on when the characters in the series started being made as merchandise and be transferred to other media. A single containing songs and/or stories called Bummi aus der DDR (no year) has been seen. From the available pictures it may be a soundsheet (i.e. a paper thin vinyl record) from an issue of Bummi. Due to Bummi presently being one of those children's magazines being published with some sort of gift attached to the issue, there is most likely quite a lot of merchandise available, with Bummi on it. 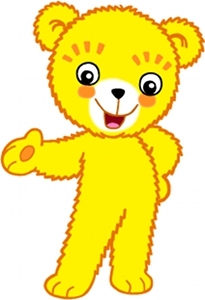 Bummi and the other characters from the series was transferred to cartoons in 2011 (26 episodes).